LONG BEACH, Calif. — Autonomous technologies and electrified equipment will have specific roles in the transportation and intermodal sectors and already are increasing safety and improving efficiency. As the technology continues to advance, it may gain adoption faster in the controlled situations within intermodal yards and drayage environments. 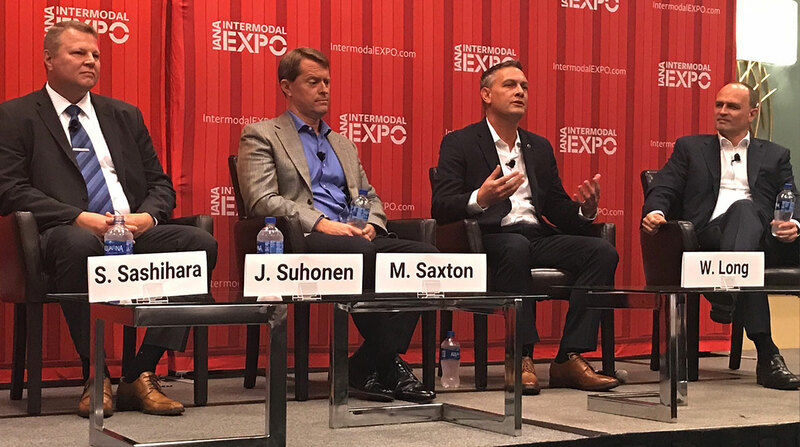 That was the thought among panelists speaking on smart equipment during the Intermodal Association of North America’s Intermodal Expo 2018 here on Sept. 17. “I think intermodal can be first and is already first in several categories,” Peloton Technologies co-founder Steve Boyd said. He was one of four panelists who took part in the discussion, “Racing into the Future: What the Next Generation of ‘Smart’ Equipment Means for Intermodal.” Princeton Consultants CEO Steve Sashihara was moderator. Jussi Suhonen, port solutions sales director for Konecranes, a crane manufacturer based in Hyvinkaa, Finland, said the company makes three autonomous products that are used in ports today. “We can automate electric or diesel-driven,” Suhonen said, adding that there have been automated vehicles, such as terminal tractors, in terminals since the ’90s. Volvo already has implemented automated technologies, including adaptive cruise control, automated transmissions and forward collision-avoidance systems, which are increasing safety, said Wade Long, regional vice president for Volvo Trucks, whose U.S. headquarters is in Greensboro, N.C. The OEM also has fully autonomous mining trucks operating in a controlled environment and a fully autonomous garbage truck in Sweden. Volvo also recently introduced Vera, an autonomous, electric vehicle intended to be used for regular and repetitive tasks with relatively short distances and large volumes of goods in a controlled environment, such as ports and factories. Vera does not utilize a human driver, but Long emphasized that, overall, autonomous does not mean driverless, particularly on the nation’s highways. “We’re a long, long ways from a vehicle traveling down the road without a driver,” he said, adding that while the technology is there, the regulations aren’t going to allow for it. What’s more, Long told attendees it is important to understand that automated and electric technologies play different roles. “Autonomy is there to improve safety for the vehicle. Electrification is something we’re bringing forward as an alternative method to power vehicles,” he said. Long said the focus on driverless technology is contributing to the driver shortage. “If you’re only hearing about autonomous, why would you, as a driver at 18, want to go get a CDL?” he said. Volvo has partnered with Peloton Technologies to advance the role of platooning as a means to increase safety and fuel efficiency. Mike Saxton, chief commercial officer for Orange EV, an electric terminal truck manufacturer based in Riverside, Mo., told attendees electrification will advance faster in the intermodal sector. The railroads already have enough electrical infrastructure at facilities to deploy initial electric yard trucks without investing in new infrastructure, he said..
Companies which had budgeted for diesel trucks already are using the money for electric trucks, which can save fleets $25,000 to $60,000 annually, Saxton said. He encouraged those that haven’t invested in the technology to begin testing it. “If you haven’t started your pilot deployments of the various technologies, you’re behind the learning curve already,” he said. Long also encouraged fleets to become early adopters. “This technology doesn’t come for free, so you have to understand that,” he said. While there will be specific applications for electric vehicles, Long said he is a big believer that there will be inline, 6-cylinder diesel engines for the next 50 years.